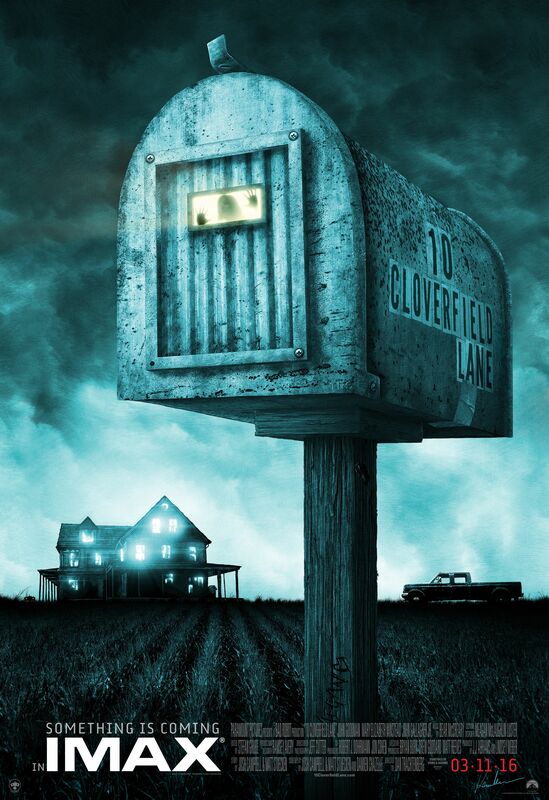 I love the original Cloverfield. I remember seeing it multiple times in the theater when it was out. I’m a big fan of the found-footage film style and that movie owned it like few others have since. However, this movie is very different from that one. 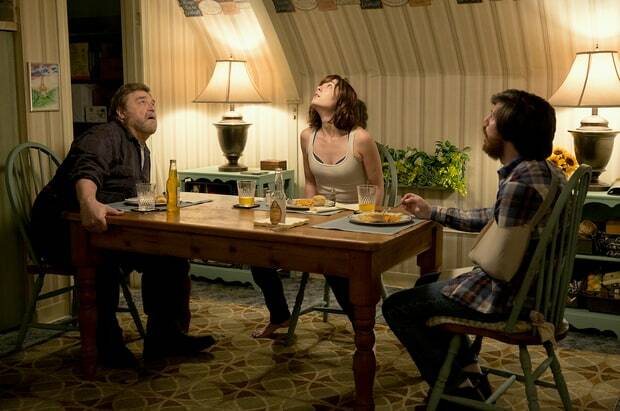 You may have heard the filmmakers quoted as saying that 10 Cloverfield Lane is a “blood-relative” of Cloverfield. What that means is, they share the Cloverfield name, but that’s really it. Most people are gonna compare it to something like The Twilight Zone, stories that are linked only by the umbrella of branding, which seems fairly accurate, but if you say that then you could say it’s like The Outer Limits, or Tales from the Crypt, or American Horror Story, or Goosebumps, or Are You Afraid of the Dark?, etc. It could be compared to any number of horror/sci-fi anthology shows, but I suppose what makes it unique is that the experiment hasn’t been tried much in the major motion picture world, and when it has been tried it hasn’t always done so well (see Halloween III: Season of the Witch). After surviving a car accident, Michelle (Mary Elizabeth Winstead) wakes up to find herself in an underground bunker with two men named Howard (John Goodman) and Emmett (John Gallagher Jr). Howard tells her that a massive chemical attack has rendered the air unbreathable and their only hope of survival is to remain inside. Despite the comforts of home, Howard’s menacing demeanor causes the young woman to plan her escape. After taking matters into her own hands, Michelle’s desire to learn the truth about the outside world comes to fruition. I’ve noticed that the biggest thing everyone is talking about is how fantastic John Goodman is in his role, and all of that talk is 100% correct. He completely commands the screen with his sinister innocence, which I understand sounds like a contradiction but that’s the best way I can explain it. He’s awkward, but you go back and forth with believing if he’s a true threat or not until the end. I would liken the quality and execution of his performance to that of Rebecca de Mornay’s in The Hand the Rocks the Cradle. There’s something always lurking beneath the surface and it could boil over at any moment. Then there’s Mary Elizabeth Winstead, who’s really in the lead role here, no matter what Goodman’s A-lister status coerces you to think. The biggest thing I noticed about her role is that at the very beginning of the film, for the first 15 minutes or so, they give you the impression that Michelle’s going to be some “damsel in distress”, an impulsive girl, ruled by emotion and needing to be saved. I assure you she is none of that. Almost as soon as you think she is, she turns on her resourcefulness and ingenuity and completely obliterates any preconceptions you have of her aptitude. John Gallagher Jr is, by comparison to his co-stars, somewhat of a newcomer. He’s been in a few things here and there over the last decade and a half, most notably HBO’s The Newsroom series, but this is definitely his most significant amount of movie screen-time to date, and he absolutely earns it. His character, Emmett, clearly serves the “comedic relief” purpose, but he does it brilliantly, and he’s much more than that. Emmett is a kind, simple character. He’s not simple in terms of lacking intelligence, I just mean that he doesn’t really have a complex depth, which is a perfect balance to how complex Michelle and Howard turn out to be. He isn’t a defeatist, but he isn’t hellbent on survival the same way the other two are. Meaning, he won’t do just anything to protect his own skin, like arbitrarily screw someone else over. His morals are genuine and unambiguous. Honestly, he was probably my favorite part because he’s the most relatable thing in the entire movie. This is the first major film for director Dan Tractenberg. 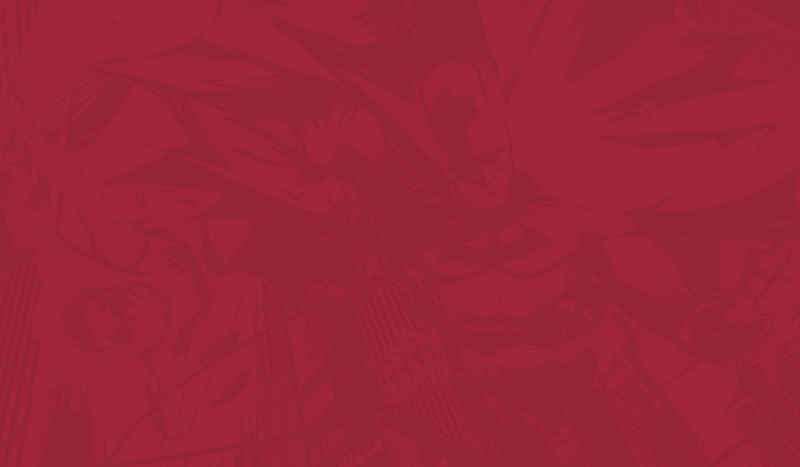 He was previously attached to a big screen adaptation of Brian K. Vaughan’s Vertigo published comic series “Y: The Last Man”, but that project was canceled. I hope that the critical and financial success of 10 Cloverfield Lane will be an incentive for that to come back around because it’s a brilliant story and after seeing this I feel like Dan could nail the tone. He’s clearly got a great ability for pulling quality performances out of his cast while maintaining a grip on the intricacy of the plot and the magnitude of the mystery within. This is also a first for the story-writers, Josh Campbell and Matthew Stuecken, who have worked in the film industry for many years, racking up credits on films like Blade II, Van Helsing, and G.I. Joe: The Rise of Cobra, but this is the first major film writing credit for either of them. I’m not sure what took these guys so long to finally get noticed for their writing talent but I’m glad they did because they’ve crafted a really intense and exciting story that keeps you on the edge of your seat for the entire time. Part of that intensity may also be due to the addition of Damien Chazelle, who worked with the Campbell and Stuecken on the actual screenplay for the film. Chazelle is the writer/director of 2014’s Whiplash, which earned him numerous award nominations and wins, including an Oscar nomination for Best Adapted Screenplay. If you’re not familiar with Whiplash then please at least watch the trailer so that you can understand how uncomfortably tense it is. Chazelle is obviously a master at injecting films with uneasiness and foreboding anxiety, and his contribution is felt here in just about every single scene. J.J. Abrams is the biggest force behind the Cloverfield films, there’s no denying that. The man has a sense for mystery that, love it or hate it, is felt all over everything he comes within close creative proximity to. My absolute favorite TED Talk of all-time is his talk on creating mystery, and where that was rooted in him. This film is no exception. There is a thick, unyielding air of mystery the surrounds this entire story, and an overarching concept of “damned if you do, damned if you don’t”. So many brilliant and talented minds helped create it, but it would never have existed if it wasn’t for Abrams’ deep commitment to the craft. Even though he may be seen as some Hollywood big shot at this point, he evades the stigma of being labeled as such due to his continued involvement with smaller, more intimate projects like this one. 10 Cloverfield Lane is an amazing film. It fires on all cylinders straight out of the gate and never once sinks below perfect. The cast, small as it may be, all deliver incredible performances, with John Goodman’s being the indisputable best. The story is fantastic and executed just right, giving us a little closure while still leaving some thing in the mystery box to decide for ourselves what may have happened and what the motivation was. I would definitely recommend seeing it in a theater because it’s a very satisfying experience to witness the unpredictability and claustrophobia of this story in a dark theater on a big screen. Movies should entertain us, but that doesn’t mean they can’t also have a message that goes beyond the superfluous ideals they’re known for peddling. While you may still leave 10 Cloverfield Lane with questions burning on your mind, I guarantee that, if you allow yourself, you’ll also leave a better understanding of what it means to confront the monsters in your own life.